Of the 630,000 people in U.S. jails today, 443,000 are awaiting trial. That is, 7 in 10 people behind bars in the nation's more than 3,000 jails are presumed innocent. Over the last 15 years, 99% of the total jail growth in the United States was in pretrial detention, and 90% of those awaiting trial in jail are incarcerated because they have not paid bond. Using their power as democratically elected officials with significant discretion, prosecutors have the capacity to devise and implement bail policies and practices that are true to the constitutional protections of equality under the law and innocent until proven guilty. Read more about how prosecutors can use their discretion to reduce the inequities in the application of bail in the IIP’s issue brief on Prosecutors and Bail. Incarcerating adolescents, especially alongside adults, has known negative effects on individuals, families, and communities. Adolescent confinement impairs one's development into a productive adult, decreases public safety, and encourages an unfair application of sanctions. 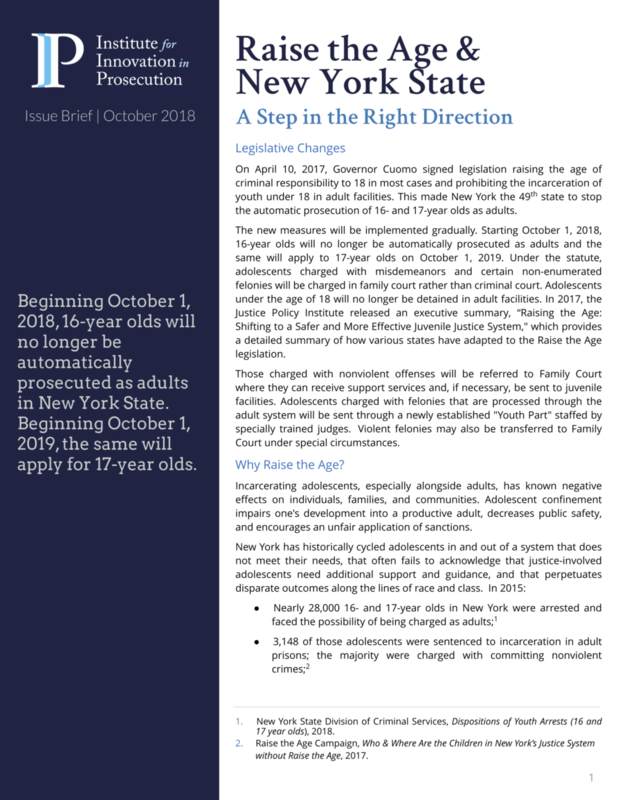 On April 10, 2017, Governor Cuomo signed legislation raising the age of criminal responsibility to 18 in most cases and prohibiting the incarceration of youth under 18 in adult facilities. This made New York the 49th state to stop the automatic prosecution of 16- and 17-year olds as adults. Read more about the importance of the Raise the Age statute and prosecutors’ responsibilities towards young defendants in the IIP’s issue brief on Raise the Age.